This very pretty estate diamond ruby engagement ring will win her heart. At the heart of this rectangular shaped ring is a bright white diamond that is framed in a square mounting. Flanking each side of this center diamond are two lovely four petal flowing flowers. 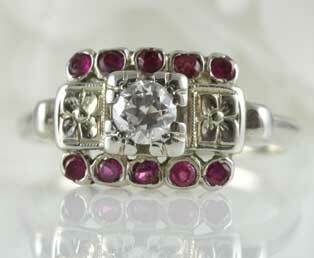 Two horizontal rows of bright red rubies add a colorful contrast to this lovely ring. Crafted in 14kt ( 585 ) white gold. Excellent condition for age, patina is visible.